I looked at the mileage on my Garmin watch — 11.93 miles. I was at Kanan Dume Road and debating whether to make Kanan my turnaround point. My run had started at Malibu Canyon Rd. & Piuma Rd., where I’d picked up the Sean O’Brien Trail Runs course at around mile 2. After crossing Malibu Creek, the 100K, 50M, 50K and Marathon courses all follow the Backbone Trail westbound from Malibu Canyon. 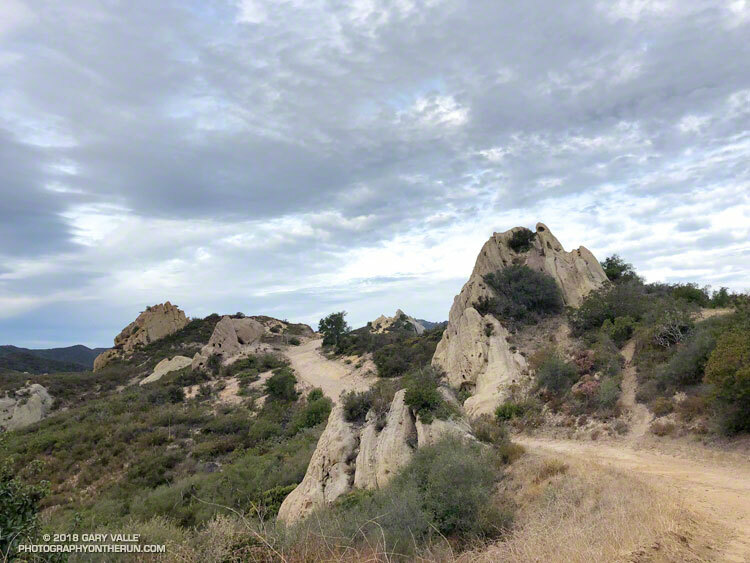 The ground had been spotted with raindrops as I started the nearly 3 mile, 1500′ climb out of Malibu canyon. Subtropical moisture was streaming in from the southwest and there was a broad swath of clouds over Southern California. There were scattered showers, but most of the rain was evaporating before it reached the ground. The last time it had rained was more than a month ago, and the smell of rain was intoxicating. A short downhill on Mesa Peak Mtwy before the next climb.. Click for larger image. Two weeks ago I’d done this climb as part of a “reverse” Bulldog loop. It hadn’t become any less steep. Most of the climb is on a fire road and some of it is runnable — just how runnable depends on your VO2max, determination and inclination. It was a relief to reach the top and start running downhill, even if another climb loomed just ahead. Rock gateway on the Backbone Trail. Click for larger image. Once to the top of this next climb, it is about a mile and a half to Corral Canyon. There are a couple of short ups and downs along the way and the rock formations become increasingly dramatic. Just east of Corral Canyon the Backbone Trail winds through a wonderland of rocks and pinnacles, climbing a steep sandstone ramp and passing through a rock gateway. A tranquil spot along the Backbone Trail in Upper Solstice Canyon. From Corral Canyon the Backbone Trail drops into Upper Solstice Canyon. Today, the 16 crossings of the small creek in the canyon were all dry. Someone had provided log seats under a sprawling oak at “heart” meadow. I had to stop for a moment just to enjoy its tranquility. On a run here in January several years ago, the area was covered in ladybugs. 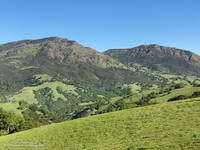 The high point of the 50K course follows the climb out of Upper Solstice Canyon and is near the saddle at Newton Mtwy. 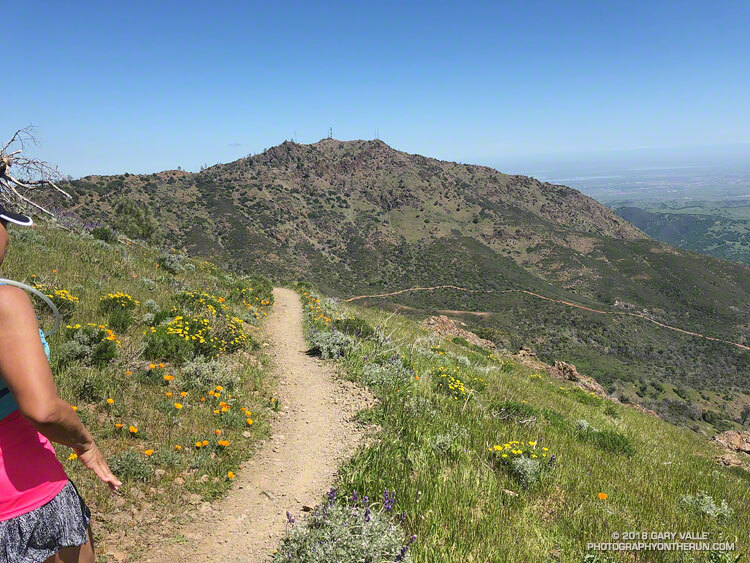 Back in the day the Bulldog 50K used to climb up and over the shoulder of Castro Peak from the top of Bulldog; then descend to this saddle and continue to Corral Canyon on the Upper Solstice Canyon Trail. This 2004 Los Angeles times article describes why the road is now gated and private. 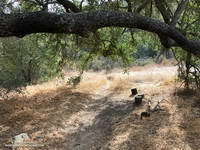 The day was a little warmer than expected and the shaded sections of trail in Newton Canyon were refreshingly cool. 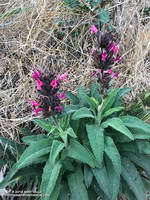 The dried out stalks of last year’s hummingbird sage were common along the trail and given the lack of rain, I was very surprised to find a plant that was blooming. The Sean O’Brien Marathon turns around at Kanan Dume Road, which is what I should have done. That would have resulted in a pleasant 24 mile training run with a bit over 5000′ of gain. Instead I decided to continue west on the Backbone Trail and “just run down to the bridge” to see if there was any water in Zuma Creek. There wasn’t. The bridge also would have been a perfectly good turnaround point that would have netted a 26 mile run. But it was one of those rare, long run kind of days where the mind and legs are in sync and the miles almost didn’t matter. I reasoned that the Sean O’Brien 50K turnaround was “only” another mile and a half away, so why not continue. That way I’d have an even better idea of what to expect on race day. Descending Mesa Peak Mtwy into Malibu Canyon. I did continue, and with the exception of running low on water, everything went well. At Latigo Canyon several runners had just returned to their cars and I was able to fill up my Camelbak(R). Thanks Lou! And thanks to the other runners at the trailhead for their offers of gels, beer and salt! I’ve run that section of the Backbone Trail several times, but never as an out and back. I now understand why the times for the Sean O’ Brien 50K are a little longer than the typical 50K. For one thing the course is about 1.5 mile longer than a 50K. For another, it has a TON of elevation gain. Using the elevation profile from my fenix 3 and a 1/3 arc-sec DEM from the USGS, the hand-calculated elevation gain worked out to be around 6000′. Tack on another 500′ of gain to account for the Tapia Spur Trail and the total gain for the Sean O’Brien 50K works out to a stout 6500′, give or take. The heat was oppressive. The air was sweltering and still, reminding me of hot nights in the South, when heat lightning flashed on the horizon, and any movement was an effort. An adductor muscle in my left leg started to cramp and I jumped up from the reclining chair. Heat, and more heat had been the theme of this day. I had returned home from running my eleventh, and hottest, Mt. Disappointment 50K, only to be caught in a widespread power failure caused by a transformer explosion and fire in a Northridge distribution station. How hot was it for the 2017 Mt. Disappointment races on Mt. Wilson? In the sun temps recorded by the Clear Creek RAWS for all the Mt. Disappointment races. Click for larger image. – Between 11:00 a.m. and 5:00 p.m. the in the sun temps recorded by the Clear Creek RAWS (on the 50K course) ranged from 115 °F to 121 °F. Out of the sun temps ranged from 94 °F to 98 °F. – Between 10:30 a.m. and 4:30 p.m. an ANF portable weather station adjacent to the Mt. Wilson Observatory recorded in the sun temps ranging from 106 °F to 114 °F. Out of the sun temps ranged from 92 °F to 96 °F. – The temperature (inside a ventilated instrument housing) on Mt. Wilson at CBS Radio reached a high of 103 degrees. This appears to be the highest temperature at that location since it came online in 2008 and may have been the hottest temperature on Mt. Wilson in several decades. – Downtown Los Angeles (USC) reached a record high for the date of 98 degrees, breaking a 131 year old record. Even more remarkable than the weather were the performances of the top runners. Ruperto Romero was the overall winner of the 50K with an astounding time of 4:38:44. This was only a couple of minutes slower than his winning 2015 time — when temps were 20-30 degrees cooler. In what must have been an exciting finish in the Women’s division, Elizabeth Ochoa cranked out a 6:19:45, just edging out Ana Guijarro by eight seconds. Victor Martinez won the 25K in 2:08:01, with Jay Nadeau taking the top women’s time in 3:05:13. All the Mt. Disappointment results are available on UltraSignup. The heat continued to build past noon, peaking between 1:30 p.m. and 4:30 p.m. This made for a long day for those of us in the back of the pack. At 1:00 p.m Red Box Road was a blast furnace, facing directly into the sun. I was very glad to have scouted the final seven miles of the course last weekend. The creeks crossing the road really helped to keep from becoming over-heated. Strayns Creek on the Kenyon Devore climb also helped me to cool down. Many thanks to Gary and Pam Hilliard and all the Mt. Disappointment staff, volunteers, sponsors and runners. The aid station personnel were phenomenal, and all their assistance was much appreciated. The efforts of the Forest Service were also much appreciated. ANF personnel were on the trails and at the aid stations, helping runners. 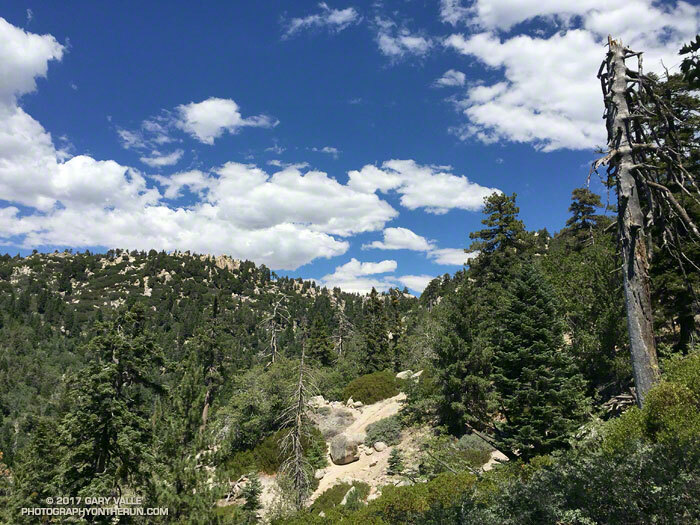 The photograph above was taken a little more than a mile from the top of the Kenyon Devore Trail, in the San Gabriel Mountains, near Mt. Wilson. 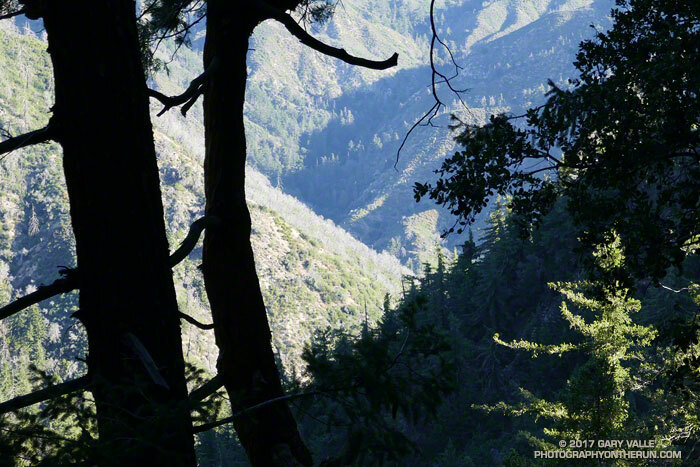 The deep canyon seen through the trees is Strayns Canyon, which the trail follows on its way from the West Fork San Gabriel River to the shoulder of Mt. Wilson. Today, I’d run down the Kenyon Devore and Gabrieleno Trails to West Fork and then up the Red Box – Rincon Road to point on the map marked Camp Ah-DA-Hi. (A former Woodcraft Rangers Camp.) With hot weather forecast next Saturday for the Mt. Disappointment 50K, I’d been glad to see the small streams that had been dry during the drought were running again. Trails have stories to tell and when I run or hike a trail I’m always curious about its history. 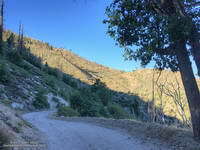 A trail between the West Fork San Gabriel River and Mt. Wilson is shown in the 1:62500 1897 edition of the USGS 1894 Los Angeles Sheet. 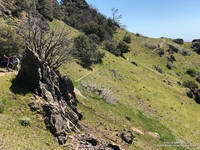 Like many trails of the era, it followed a ridge, in this case a ridge just east of Strayns Canyon. Antennae on Mt. Wilson at the top of the Kenyon Devore Trail. The first USGS map to show a trail along Strayns Creek was the 1:24000 1934 Mt. Wilson Advance Sheet. The trail remained unnamed in USGS maps until the 1966 edition of the 1:24000 Mt. Wilson Quadrangle, when it was labeled the Rattlesnake Trail. 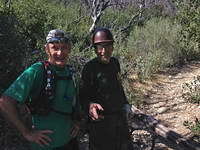 The trail was renamed the Kenyon Devore Trail in the 1995 edition of the map in tribute to Forest Service patrolman, hydrographer, and Angeles National Forest volunteer, Kenyon DeVore. The Kenyon Devore Trail is part of the Mt. Disappointment 50K course. 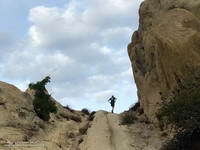 It is one of several trails maintained by runner-volunteers under the guidance of Forest Service volunteer and Mt. Disappointment Race Director, Gary Hilliard. Today, as I was on my way back up to Mt. Wilson, I ran into Gary and two volunteers cutting logs from the trail in preparation for next Saturday’s event. Gary and the Other Gary on the lower Kenyon Devore Trail. The grueling 5 mile, 2650′ climb from West Fork to Mt. Wilson on the Gabrieleno & Kenyon Devore Trails comes at about mile 26.5 of the 50K and is the highlight of the run. I have to laugh about what happened on the Kenyon Devore climb one hot year. I’d jammed my Camelbak(TM) with so much ice at the West Fork aid station that when water was added, it melded and froze into one large chunk. I didn’t discover this until about halfway up the climb, when I ran out of water. You can’t drink a chunk of ice and even at 90 degrees, the ice was melting at an agonizingly slow rate. At best I could only get a minuscule sip of water from the pack every few minutes, and it nearly imploded from my efforts. 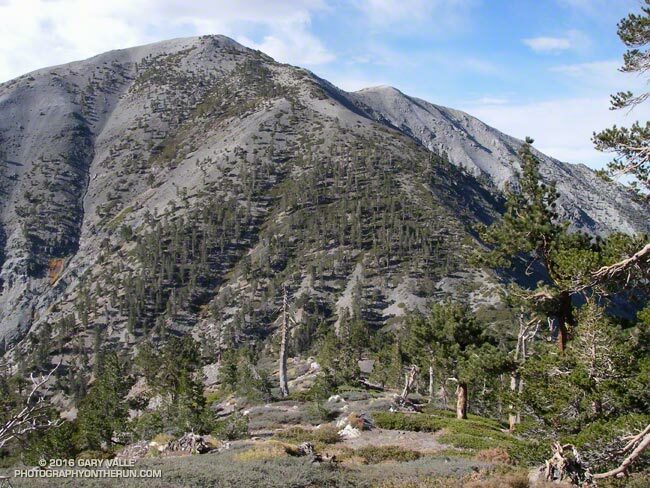 The Big Pines Trail Marathon — First Organized Mountain Ultra in the U.S? 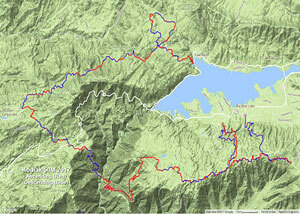 What would you think of a 44 mile trail race with 10,000 feet of gain that climbs Mt. Baden-Powell… and Mt. 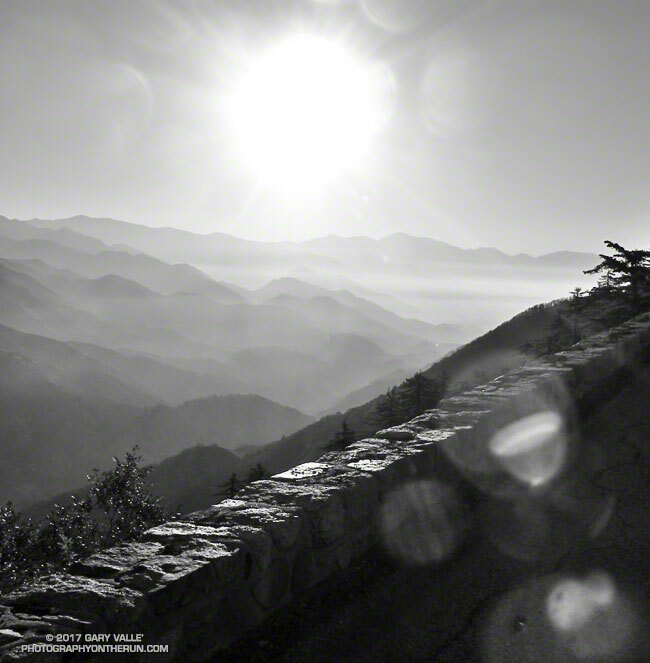 Baldy… by the North Backbone Trail… at night… by the light of a full moon… with the requirement to carry 10 percent of your body weight, NOT including the additional weight of food and water? The Big Pines Trail Marathon was first run on August 23-24, 1934. Based on the description in the Autumn 1934 edition of Trails Magazine, the course would rank high among the toughest mountain courses we run today. The winner of the inaugural 41 mile race was 24 year old Paul V. Engelhart, an Assistant Scout Master, in 14 hours, 45 minutes, 15 seconds. Second place went to 17 year old Fairfax High School track team member Bain J. Bain in 14 hours, 48 minutes. Trails Magazine Big Pines Trail Marathon Trophy. Photo: Los Angeles County Department of Parks and Recreation. In 1935 the Start was moved to coincide with the Finish at Davidson Arch, increasing the mileage to 44 miles. According to the Trails Magazine report, the race began at 5 p.m., the seven contestants starting at 10-minute intervals. Engelhardt won again in 1935 in a time of 13 hours and 32 minutes and for the third time in 1936 in a time of 13 hours and 13 minutes. In the Fourth Annual event in 1937 Engelhardt’s record for the 44 mile course was broken by Ray Ebel, who finished in a time of 13 hours 3 minutes. Winners of the 1938 Fifth Annual Big Pines Trail Marathon. Photo: Los Angeles County Department of Parks and Recreation. Perhaps in an effort to make the course more straightforward, it was changed for the Fifth Annual race in 1938. Instead of returning from Mt. Baden-Powell and climbing Mt. Baldy via the North Backbone trail, the course continued west along the route of the present day Pacific Crest Trail (and AC100) to Windy Gap. At Windy Gap (then called Islip Saddle) the course descended to Crystal Lake Recreation Camp, turning around at the Ranger Headquarters for the 20 mile return to the Finish at Big Pines. Even in bad weather, the new forty mile course was more runnable and faster-paced. The report in Trails Magazine describes a competitive race that Big Pines Ski Club member Charles Melhorn won in 9 hours and 23 minutes — just 17 minutes ahead of Marine Reservist Don Wood. That works out to an average pace of 14 min/mile, with much of the running at night!